Here are the lines for tonight’s NCHC Frozen Faceoff against North Dakota. It’s a huge weekend for the NCHC. As the inaugural season of the National Collegiate Hockey Conference comes to a close, we are left with the inevitability of a new gathering of college hockey fans at new venues in new cities. It it officially the blending of the old — the WCHA’s Final Five as represented by North Dakota and Denver with the CCHA’s “Hockey in the D” being repped by Miami and Western Michigan. And, with both the WCHA having been relegated to second tier status playing their tournament in Grand Rapids, Mich. and the Joe being empty of college hockey this weekend, it does seem that we are certainly moving on. But, what have we learned this year? And, was it better? Will it be? Did fans fawn over new and existing rivalries? Was the action so riveting in the NCHC (and the Big 6) that all of this was really necessary? While the on-ice product during the regular was at best a “meh,” the playoff action in the NCHC has thus far been fascinating with three “lower seeds” moving on to compete in the Frozen Faceoff this weekend in Minneapolis. Of course, those lower seeds included 7-time national champions Denver, 2012 Mason Cup champions Western Michigan and 2012 CCHA regular season champions Miami. Not exactly “lower seed material.” But, this season has certainly proved that someone has to finish last in a highly competitive league. This year it was Miami, but they of course promptly dispatched the first ever Penrose Cup champions, St. Cloud State, in two games. 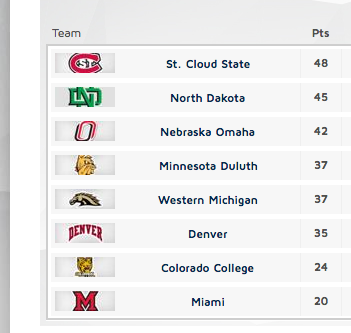 But, it’s certainly clear the NCHC has much riding on this weekend. Minneapolis’ Target Center selection as the venue for the NCHC’s Frozen Faceoff raises questions. First, the venue. The Target Center is a facility with one full-time tenant, the Minnesota Timberwolves of the NBA. Yep, it’s a basketball facility first and foremost. The last time the WCHA held a Final Five tournament there, in 2000, there were catcalls from many who attended saying it’s not a good venue to host the sport. I can’t speak to the hockey games (if any) that have been held there since, but some are saying improvements to the facility bode well for the weekend. It would be a nice-to-have if the NCHC doesn’t have to endure heat over the selection of Target Center, but the location in downtown Minneapolis, is superb. Second, attendance. You know former Miami man and NCHC commish Josh Fenton has to be breathing a huge sigh of relief that North Dakota was able to overcome the challenge from Colorado College to earn a trip to the Frozen Faceoff. As it is, the three dance partners add very little in terms of a traveling fan base. Denver is simply too far away and they don’t even draw 50 students to their regular season games at Magness Arena. As for Miami and Western Michigan, it remains to be seen. Western had traveled well to the Joe the past few years, but that’s all of a two-hour drive from Kalamazoo. I might ordinarily suggest that they would have more fans than Miami this weekend, but with the basketball Broncos earning a berth (and being blown out by Syracuse right now) in the NCAA tournament, that might have picked off some of their fans. Speaking of the red and white, we all know we have a fan base that’s reluctant to travel, and in a year that saw Miami finish dead last in the regular season, and with the NCAA tournament regional being hosted by Miami in Cincinnati, I have to believe most fans will simply wait it out. If Miami wins the weekend, they’ll attend next weekend in our backyard. If not, well, at least they got to watch the games on CBS Sports Network. 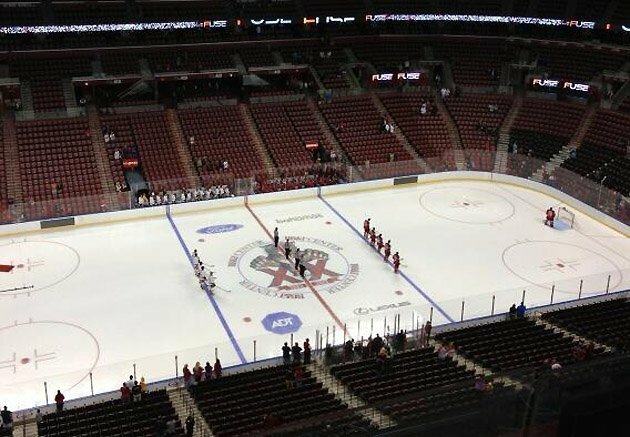 Will NCAA hockey venues look a lot like Florida Panthers’ games this weekend? Assuming North Dakota brings 5,000-7,000 fans and you get 1,000-2,000 from DU, MU and WMU, plus another 3,000 or so who are fans of other Minnesota NCHC schools or just college hockey fans, maybe, maybe we could see 10,000 in the building. Anything more than that would be fantastic but unrealistic, especially considering the Big 10 tournament is being held in nearby St. Paul and features the home squad, Minnesota. But, that brings about another thought. The old WCHA would jam the Xcel Energy Center to see Minnesota, North Dakota, SCSU, UMD and Wisconsin go toe to toe. Now, the WCHA will draw, maybe, 5,000 for their games at Van Andel Arena in Grand Rapids for Anchorage, Minnesota State, Bowling Green and Ferris State from nearby Big Rapids who you’d think will have by far the most fans in attendance. And, as I write this, I’m watching Michigan and Penn State play in front what appears to be a crowd of three people at Xcel right now. When the CCHA would hold its tournament weekend in Detroit, you always knew Michigan would bring between 10,000-15,000 fans for their games, regardless of the time. And, when Michigan and Michigan State would play, the building would be full. Well, it seems we had it pretty good, and I’m hopeful Xcel will be full when Minnesota and Wisconsin come calling. One thing is certain, Hockey East is making out like a bandit as their league changed the least and only strengthened itself with the addition of Notre Dame who has also had to adjust to a quite a bit more travel — and it showed with their eighth place finish in the regular season but it advanced by knocking off the #1 seed — sound familiar? And, the ECAC has not yet been touched by realignment so things were as they always had been. Consistency has its advantages. Will Miami be on the defensive against North Dakota or will they have the same jump we saw last weekend against St. Cloud? has affected any of the other schools? Denver and Colorado College are obviously exempt because they have had to fly everywhere for years. But for the other programs, were all the extra flights, bus rides and shuttles as draining as they appear to have been on the RedHawks? Bus rides from St. Cloud to Madison were replaced by flights to Kalamazoo. And, that speaks nothing for travel costs which were obviously much higher for Miami and Western Michigan, especially, than they had ever been. So, will Miami have anything left after back to back trips to Denver and St. Cloud? We understand they stayed in Minnesota all week, but that has to take a toll on bodies at this point in a hockey season nutritionally, sleep-wise, workouts and recovery, everything. Will they be able to muster the energy required to take on North Dakota and its fans? So, the real question…is all of this sustainable? We are already beginning to hear whispers that another round of realignment is forthcoming. Perhaps inevitable. And, how does Alabama-Huntsville really continue to field a Division I program? Will college hockey continue in Alaska now that they are kind of “isolated together?” Is the Big 6 plan sustainable? Will they have to add other Big 10 schools to make this interesting? Will they pressure the Illinois’ and Indiana’s of the world to step up? And, will the schools of the “like-minded” NCHC decide that maybe this whole thing wasn’t so great after all? 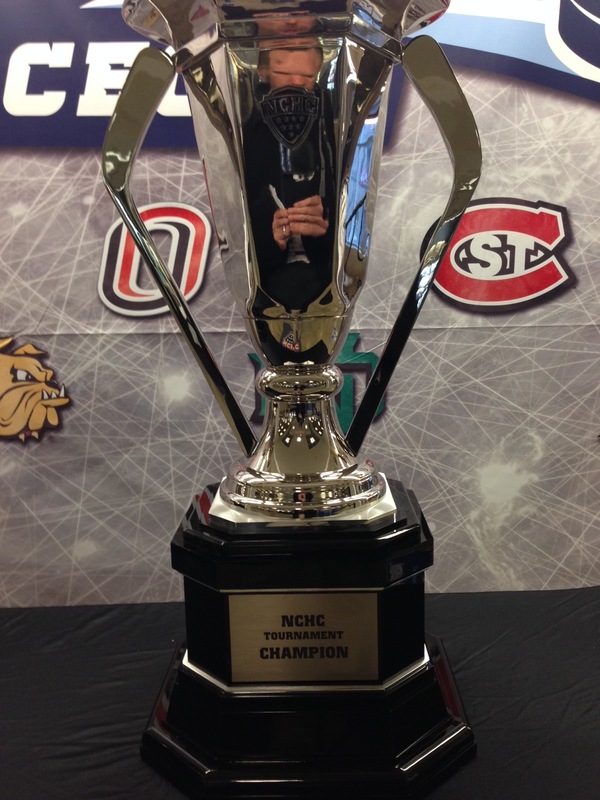 Will the WCHA have the last laugh should the NCHC dissolve? Whatever happens, it might not be good for college hockey. If this year is any predictor of the future, the game really didn’t seem to advance all that much. Well, at least not quite yet. It’s truly is the most wonderful time of the year! With the NCAA basketball tournament starting in earnest today and NCAA hockey’s conference tournaments hitting full stride, this weekend is one of my most favorite sports weekends of the year. Miami is unaccustomed to looking up in the standings, but they did this year. the Penrose Cup champions in a two-game weekend series sweep. Yet, Miami will not earn a berth to its ninth consecutive NCAA tournament without winning two more games this weekend. A team that as recently as February 14-15 defeated Miami 3-2 in a game UND led 3-0 and then handed the RedHawks a 9-2 whipping the likes of which this program hadn’t seen since the 1990s. The teams split their series in Oxford way back in October with North Dakota winning 4-2 and then Miami dishing out a 6-2 whipping of their own a night later. However, the lost weekend in Grand Forks perhaps began to ignite a little spark in the RedHawks. Buoyed by the return of Blake Coleman, Miami would begin to play a little better. Splits in two of the next three series marked by incrementally better play defensively and in net, set Miami up with a chance to go into St. Cloud and knock off the Huskies. Miami had split both regular season series with SCSU so last weekend’s outcome wasn’t all that surprising. Miami is still not there yet. Blake Coleman’s return from injury has given the RedHawks a spark. If they have any dreams of winning the NCHC conference tournament and advancing to the NCAA tournament, they will have to find a way to shore up defensive lapses that have plagued the team all season. Dennis Green’s famous quote, “they are what we thought they were” most definitely applies here. As much as we’d like to think this team is better than it really is, the fact is they have played as poor defensively as a club as any Miami team in recent memory, and despite having all kinds of offensive talent, it still might not be enough. What’s clear is they are not going to win too many 2-1 games. But, if the offense can get to four, Miami will have a real chance to win two games this weekend and carry the dream forward. That said, Miami will have to get past a team that has rounded into arguably the best team in the NCHC and one with a significant home-ice advantage tomorrow night in North Dakota. Gang Green (I don’t know what to call them) has one of the best traveling fan bases in all of college sports and you can figure they will have an overwhelming number of supporters all weekend long. But, rooting for the underdog, and against North Dakota, is always chic. I expect those in attendance from UMD, UMTC, SCSU and others to pull for the RedHawks and maybe just give them a little boost. The crowd will most certainly get behind Miami should they take the lead or keep it close. And, I do believe this will be a close game. Coleman’s return gives Miami four complete lines and gives head coach Enrico Blasi the abilty to split up snipers Riley Barber and Austin Czarnik pairing either Coleman or Sean Kuraly with them. Then with Alex Gacek, Alex Wideman and Cody Murphy set to offer scoring ability throughout the lineup, it does make Miami more difficult to defend. There is an awful lot of offensive talent on this team which simply makes this season that more perplexing. One theory I have, and that I’ll get into in another piece, is that Miami was unprepared for the toll that the new travel schedule would take on the team. Anyway, this weekend rests on the shoulders of the offense. But, if Miami can get decent contributions from the blueline (in terms of clearing rebounds, playing without turnovers and making smart plays up the ice) and if Ryan McKay can be in top form, there’s reason to believe Miami can win two games this weekend and move on. That would be my immediate reaction to reports by both College Hockey News and USCHO that Western Michigan University and St. Cloud State University are expected to join the new National Collegiate Hockey Conference that will start play in 2013-14. According to reports, both schools will be invited by week’s end. Both websites cited separate sources with CHN naming the Grand Forks Herald and USCHO citing the Kalamazoo Gazette. So, what does this mean for Notre Dame? I think it means they are going to play as an independent while their administration very likely considers a new conference for their other sports as the dramatic changes in college athletics continue. It wouldn’t surprise me to see Notre Dame join either the Big 10 or the ACC for all sports. Of course, only the Big 10 helps the Irish (why Notre Dame gets away with using “Fighting Irish” and others like North Dakota are crucified for using “Fighting Sioux” is beyond me, but a story for another day) on the ice so things are going to be more difficult for them until the situation is resolved. Notre Dame has committed to announcing a “decision” within 10 days. As for the NCHC, the addition of Western Michigan makes all the sense in the world. Heavy commitment to hockey, Division I in all-sports, travel partner and MAC rival with Miami, Andy Murray at the helm, etc. However, I’m perplexed by the addition of St. Cloud. When the NCHC announced the formation of the conference, “like-mindedness” and a commitment to hockey were noted as key tenets that brought these schools together. I must confess I do not know a ton about St. Cloud as a university, but I know they aren’t a Division I school (though defending national champion UMD isn’t either), they aren’t highly regarded academically and I can only hope assume their ability to support hockey at this highest level is not a challenge for them financially. Plus, St. Cloud’s president went on the record saying the Huskies would not accept an invite to the NCHC as our pal Goon reported a few months back over at Goon’s World making him either a slick politician or an absolute hypocrite. So, I’m wondering what SCSU brings that Bowling Green doesn’t? It’s another Minnesota school which is a boon for recruiting, but Bowling Green is a Division I school and inviting them would have kept the three hockey-playing MAC schools together. If Notre Dame wasn’t (ever) going to accept the invitation, I wonder why the NCHC is going with a small non-Division I school over a program that has won a national title, has reaffirmed their commitment to hockey and is a three-hour drive from Oxford, Ohio? More on this to come over the next few weeks I’m sure.